When I lived in Pennsylvania I loved going to the Catholic Church summer fairs. They always had a lot of good food, but my favorites were the potato pancakes. I had forgotten about them until a recent trip to the Oregon Coast. My favorite breakfast restaurant in Seaside, Oregon is the Pig-N-Pancake. Their potato pancakes reminded me of the ones in Pennsylvania, although they were different like a cross between potato pancakes and hash brown potatoes. I figured I could make something similar and this is the recipe I came up with. 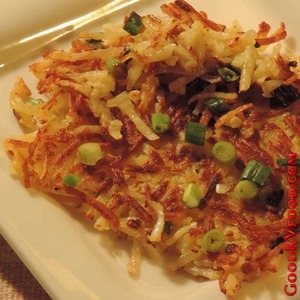 This recipe not exactly the same as the summer fair or restaurant potato pancakes, but it sure was yummy and easy enough to cook in an electric skillet out on the picnic table. You can add any spices or flavors you like, I added a little of my secret seasoning, celery salt. You can serve them with applesauce or sour cream but I enjoy them plain. Follow the directions on the package to rehydrate the potatoes. I used the ones I get at Costco, the 4.2 ounce box is perfect for two people. In a large bowl stir the beaten egg with the rehydrated hash browns to coat. Add the flour, salt, pepper and scallions and mix well until the ingredients are evenly distributed. Pour enough oil into your pan to just cover the bottom and heat over medium high heat until the oil starts to shimmer. A cast iron skillet works best for me at home but an electric skillet on the picnic table both gets me out of the RV kitchen and out into the fresh air. If the oil is not hot enough the pancakes soak up more. Drop potato mixture by large spoonfuls into the pan and smash down to a fairly thin pancake. Cook about 3-4 minutes until golden brown on the bottom then flip. Cook another 3-4 minutes and place on the plate. Pat with a paper towel to remove excess oil. For a more traditional old world flavor serve with a little sour cream or apple sauce on the side.